It's been 6 months since I first learned how to bike. It's funny, weird even, but there really are people like me out there. And no, my childhood wasn't traumatic or boring either. It's just that I never knew how to bike until my 26th. Check this previous post to know how it finally dawned on me that it's really a needed skill. 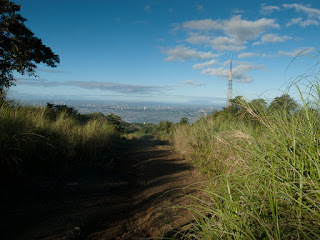 My 6-month stint with Foldie (my folding bike) and Aaron's MTB led me to my recent endeavor: riding on a trail. There's a group in the office who regularly rides on weekends. So one Saturday morning, I went ahead and gave it a try. Thanks to my boss who had an extra mountain bike. Foldie would have folded on the trail, in all literal and figurative meanings of the word. Timberland Heights is located in the heart of San Mateo, Rizal, 30 minutes away from Eastwood. The mostly uphill drive is a pretty good preview of how the trail is. I should have decided to stay at the parking lot at that point, but I didn't because I know I'll surely hate myself if I backed out. At 7AM we rode out of Timberland Sports and Nature Club parking lot. The first few minutes was a leisure, until we got to the rough parts. 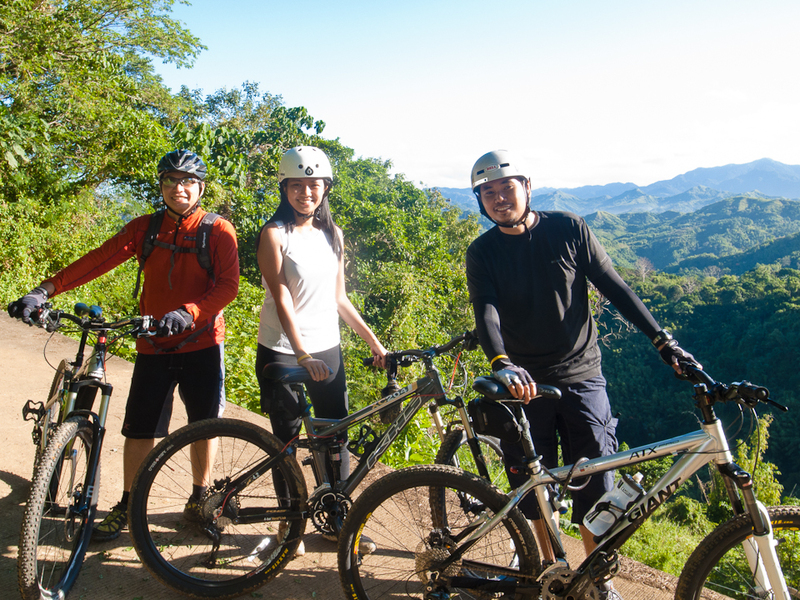 We took the scenic Roxas Loop and made occasional stops to take photos. The trail was tricky enough for me. Half of the time I was cursing, the other half I was cheering myself on. Cliff by the side of the trail - all first timers need to have their photos here! 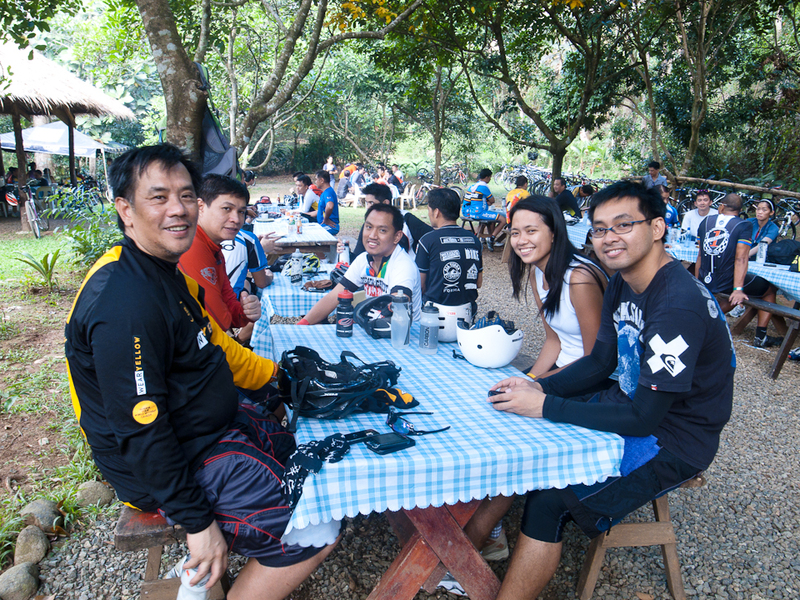 After an hour or so, we finally got to The Breakfast Club at the Pestaño Farm, our stop for a much needed filling meal. All the tables were full with groups of riders all eager to grab a bite. We took the Beginner's Trail on the ride back to the parking lot and true to its name, it was relatively easier and shorter than the first. It was 3hours and 15 kilometers of cursing, free-wheeling, cheering, walking, and panting. 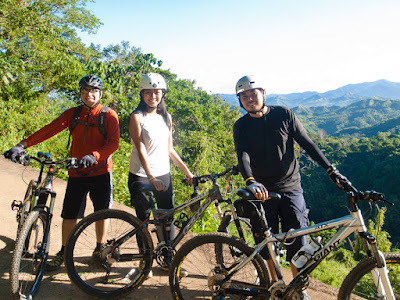 I dragged my bike through most of the uphill climb when I could no longer catch my breath and took my lovely time whenever I was faced with a steep downhill trail. I realized that I need to lose the fear of falling face-first. Only then will I be able to take in more of the view and enjoy most of the ride. Thanks to the very supportive group who patiently waited for me. 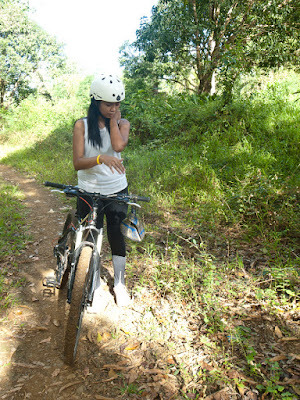 I'm up for another ride as soon as all my bruises are healed. My bike trainer is offering lessons for adults. Here's the ad. Let me know if you need one!